Construction: Die-cast aluminum casing, Epoxy sealed potting. 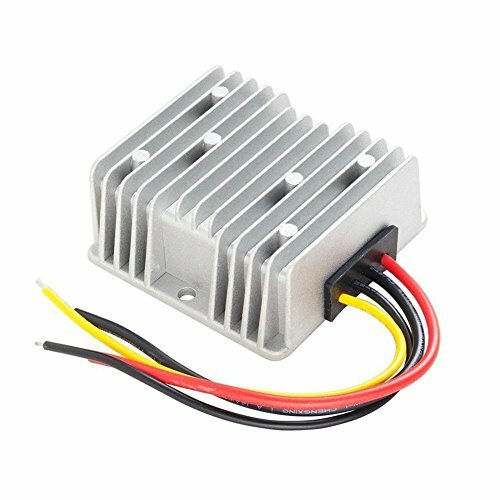 Operating Temperature:-40~75°C(Temperature more than 40°C, please reduce power use, or the use of aluminum plate thermal conductivity, or air-cooled enhance heat dissipation). Please shorten for electric lines a long distance between the input from the < 20 cm, to avoid input line is too long, cause the line pressure drop, make the power supply voltage is not enough, damage to power supply and electrical appliances, the input voltage of positive and negative polarity shall not reverse. Voltage Reducer 48V To 12V 20A, Made of first Class aluminum. Compact and solid design, wiring diagram labelled on the back, easy to wire up, No humming or shutdown during using. Commonly used for radio, speaker system, club car, electric Bike, solar panel, LED lights an so on. With the protection of input Momentary high Voltage, output over current and short circuit, over heat protection. Stable and reliable performance.Easy and simple installation. If you have any questions about this product by ExGizmo, contact us by completing and submitting the form below. If you are looking for a specif part number, please include it with your message.